You City: Sample Map of Manhattan from digitalurban on Vimeo. 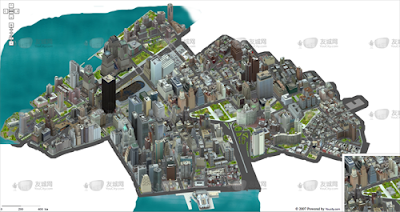 A while ago we posted about ShangHai WangCheng Net Tech Co., Ltd and their maps of cities in China created in a unique ‘sim city esk’ point of view. The company has partnered with YouCity.com to explore the western market and have just released 3 demos maps of Manhattan. The results are stunning (see the movie above) with the final version offering multi-angle viewing and an open api promised. You can take the samples for a spin yourself by visiting http://www.youcity.com. Such maps certainly raise the bar on what will become the norm in city mapping over the next few years. YouCity looks like it is going to be successful if they can make a full complete of Manhattan and get overlays on the map. Still, an incredibly well done job by the YouCity team.